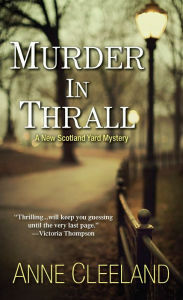 Anne Cleeland's characters and her writing style in her first Acton and Doyle Scotland Yard mystery, Murder in Thrall, completely captivated me. This unusual book launched what is now a three-book series, with, hopefully many more to come. Acton and Doyle are a fascinating, gifted team. None of the other detectives can believe that Chief Inspector Michael Sinclair, Lord Acton, selected an Irish first-year detective, Kathleen Doyle, for his investigative team. But, she has an uncanny gift to read people, to tell when they're lying, and it proved useful on the first case together. She can't believe he forgave her first major mistake, allowing a suspect to leave when he locked her up. But, the reclusive and unapproachable Action has reasons for every request he makes, even the ones that seem unusual. Right now, the couple are working the case of a horse trainer, murdered before he can reveal secrets that possibly involve money laundering at the racetrack. But, as subsequent murders occur, they seem to have less and less to do with money laundering. Neither detective can guess how personal the murders will become. Once in a while, a mystery comes along, so polished, so intricately woven that it's hard to reveal much about the plot. In fact, I can say little about the style in which this mystery is written without spoiling the introduction to the characters. Instead, I'll mention the complicated, fascinating characters in this intricately plotted mystery. Doyle went into police work, hoping to combine her passion for crime shows with her perceptive ability. Acton has a reputation at Scotland Yard, and throughout London as the "brilliant, titled chief inspector who regularly solved high-profile murders". Although the story revolves around these two, Cleeland also introduces other interesting characters working in the department. But, it's Doyle and Acton whose cases and relationship dominate this character-driven crime novel. Murder in Thrall grows in intensity, matching the complex relationships in the book. It's a suspenseful story of obsession, one that actually leaves some threads unresolved, undoubtedly to develop in future mysteries. It's an "enthralling" story for many reasons, not least of all the growing connection and understanding between Doyle and Acton. Fortunately, for readers only discovering Cleeland's smart, intuitive characters, there are already two more books this series. It's not every day a remarkable crime series comes along with two such compelling characters. Murder in Thrall by Anne Cleeland. Kensington Books. 2013. ISBN 9780758287915 (hardcover), 282p. Thanks for this review. I am reading it now.